My Son Son loves puzzles, especially floor sized puzzles. Out of all of his toys and games, he always picks a puzzle, his favourite being a space ship one. So when we were asked to review a Thomas the tank engine puzzle I knew he would love it. 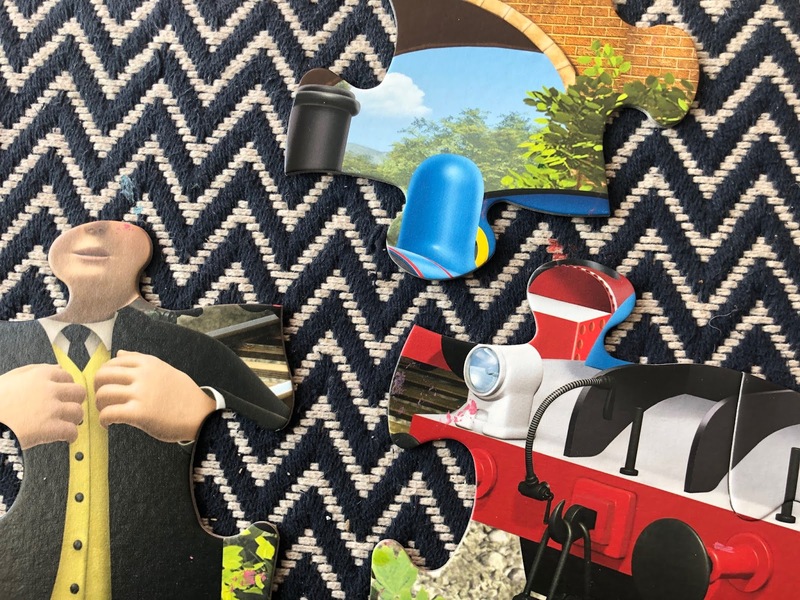 The puzzle we were sent was a 24 piece giant Thomas the Tank Engine floor puzzle. Aimed at children aged 3 plus its the perfect size for smaller children. 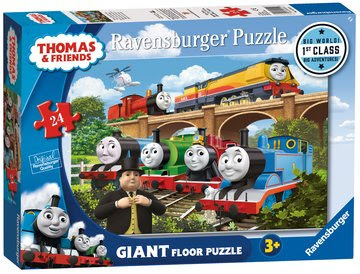 The puzzle is based on the latest movie Thomas in Big World Adventures. 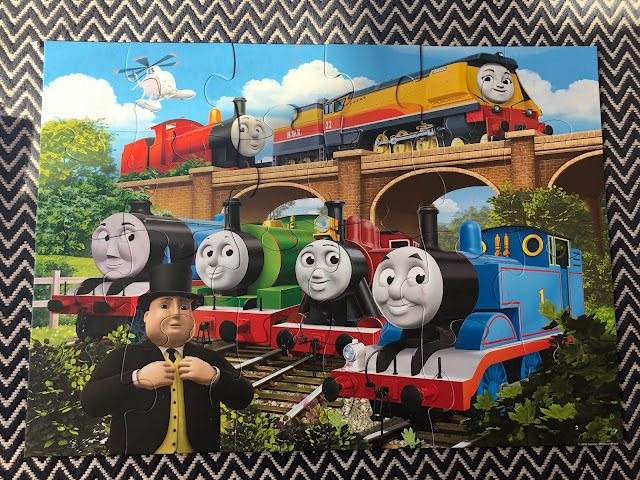 It shows Rebecca joining the Sodor steam team aka "Steamies" It features other favourites like Thomas, Rosie, Percy Gordon and James not to forget Harold the helicopter. My kids have loved Thomas especially Ast who had all the toys and we spent hours watching the show when he was small. Sadly he is now 12 and is far too cool for Thomas the Tank engine puzzles. Son Son was keen to start putting the pieces together he started on the edges working from the outside in. The colours are bright making finding the pieces easy for little people. The puzzle is made of good quality cardboard. It's strong and finished with a linen finish to minimise the glare on the puzzle. Ravensburger is known for there good quality products. They have over 100 years of experience of manufacturing puzzles. All of the puzzles are stamped to such precision that all the pieces fit in beautifully. 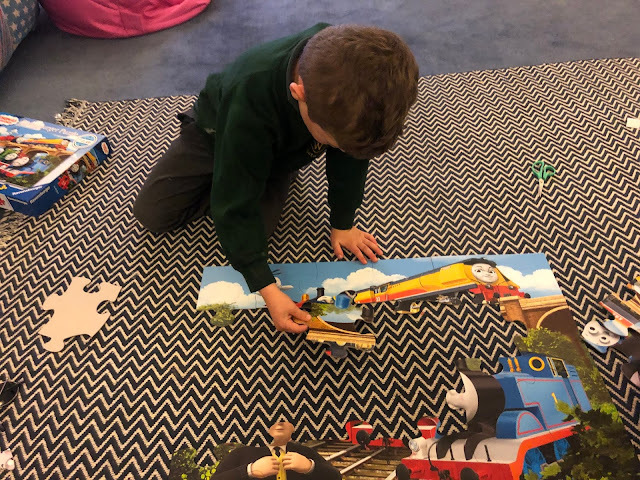 Thomas & Friends Big World Big Adventures Giant Shaped Floor Puzzle has 24 pieces and is suitable for ages 4+ and available from Amazon and all good toy shops. You can find more of our reviews on Ravensburger puzzles and games. All in all, we were lovers of the puzzle. Especially Son Son who has made it a few times over the last few weeks.